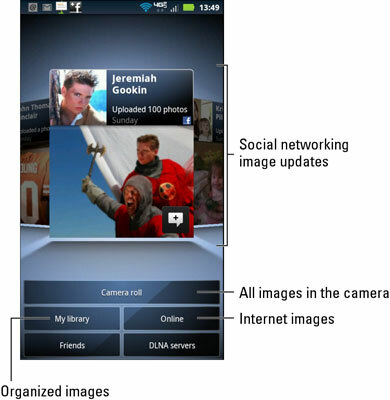 Eventually, you have dozens, if not thousands, of images in your Droid Bionic. They’re all stored in one long spaghetti string in the Gallery app, visible by endlessly scrolling through the Camera Roll. If you want to exert a little energy and organize your pictures and videos, you need to create an album. The Gallery app automatically creates two albums for you — one for still images and a second for videos. 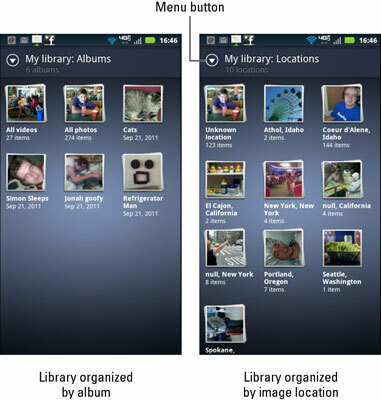 You can view these albums, as well as any others you’ve created, by touching the My Library button on the main Gallery screen shown in this figure. When you touch the My library button, the Library screen appears, as shown here. In the figure, Album view is shown, along with Locations view. You can touch the Menu button (refer to the figure) to display your phone’s images by their locations or tags, or chronologically. To view an album, touch its thumbnail. The album opens and displays its contents, similar to the way the Camera Roll appears in this figure. Press the Back soft button to back out of an album and return to the Droid Bionic’s Library screen.